A brilliant innings from captain Michael Clarke put Australia in a commanding position on the second day of the Ashes Test at Old Trafford. 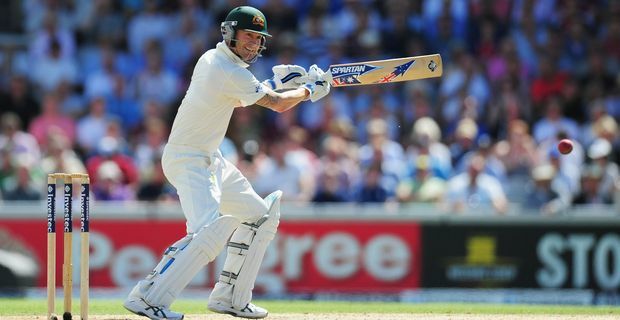 Australia need to win the match to keep their Ashes hopes alive and Clarke's 188 gave them an excellent chance. Australia declared their first innings at 527-7 on a pitch that was looking promising for spin bowling. Graeme Swann had claimed five of the Australia wickets and Australian spinner Nathan Lyon soon had the England openers looking nervous. Clarke's batting was the obvious difference from the lacklustre Australia seen in the first two Tests. Under pressure from all sides, Clarke led by example, and others, notably Brad Haddin and Mitchell Starc followed his lead as Australia piled on the runs. It wasn't all good news for Australia. David Warner, returning to the side after his ban for punching England's Joe Root in a bar before the Ashes, was out for just 5, inexplicably choosing to review the decision after clearly edging the ball to Matt Prior. England's reply was tentative, with Root looking very uncomfortable before Peter Siddle claimed his wicket for just 8. The nightwatchman Tim Bresnan was another victim of the same bowler although he was unlucky to be given out caught when he appeared to have missed the ball. It was the latest strange umpiring decision in what has been a contentious series. Australia are in a very strong position, but Clarke will be aware that time might also be a factor in the Test. There is a possibility of bad weather on the way and Clarke will be keen to take wickets as quickly a possible with the aim of forcing the follow-on if possible. Much will depend on the ability of captain Alastair Cook and Jonathan Trott to withstand the onslaught.